Makarska is among the most popular summer destinations on the Croatian coast. The combination of mild Mediterranean climate, unseen natural beauty, pure blue sea, rich cultural heritage and excellent service makes Makarska a perfect destination for your summer vacation. It offers everything you need: a great choice of accommodation, beautiful beaches, recreation possibilities, excursions; numerous restaurants and nightclubs as well as museums, galleries and cultural events. There is something for everyone, whether you seek for an active vacation or you just want to take it easy and enjoy the peacefulness of the seaside. The best way to reach Makarska is through Split. You can catch one of the regular buses driving towards Makarska at least every hour. If you travel by car, just follow the Adriatic Main road towards Makarska; it is a one hour car ride away. 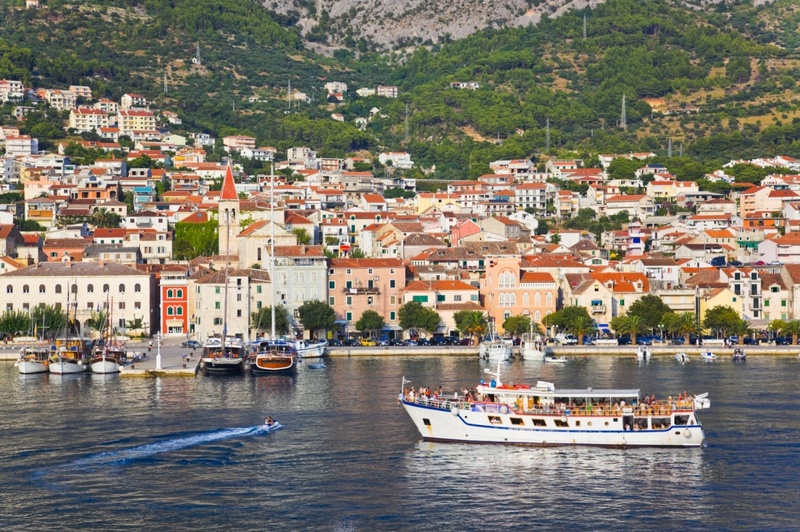 There is also a regular ferry connection between Makarska and Sumartin on the island of Brac. The accommodation possibilities in Makarska are practically countless. Depending on your preferences, you can stay in one of the city hotels or numerous private facilities, and there is even a camp. Several hotels offer are four-star resorts with numerous additional services and activities. The most valued among them are Meteor, Park and Osejava hotels. Private accommodation ranges from simple rooms to rentable houses. The main reason most of the visitors love Makarska so much are its numerous beaches of immense beauty, crystal clear and pure blue sea, protected by the rich pine and palm trees. Most of the beaches are covered in fine pebble or golden sand and are suitable for families with children as well as for couples and friend groups. If you ever get tired of soaking in the amazingly fresh and soothing sea, there is a variety of summer sports and activities you can try in Makarska: from paragliding, sailing, diving and fishing to hunting, cycling, climbing and many more. If you are interested to learn more about the history of Makarska, you should visit its 5 centuries old Franciscan Monastery and explore its museums, libraries and collections. Makarska has a long and rich history, dating all the way back to the prehistoric times. Illyrian tribes were the first known inhabitants of this area. Through the history, Makarska changed different inhabitants and governors; from ancient Romans, Croatian kings, Venetians, Turks, to French and Austrian rulers. Being situated between the two peninsulas and protected by the high mountain, Makarska has always been an extremely safe harbor; often serving as a refuge for the pirate and merchant ships throughout its long history. Almost 2 km above the city rises the Mountain of Biokovo, the protected nature park. In order to complete your stay in Makarska, you should definitely visit this place of immense beauty, unique vegetation and diversity of animal species. You can reach the highest tops of Biokovo by foot, by car or with some of the numerous organized excursions and enjoy the unforgettable view of the city and the surrounding islands. Apart for its natural beauties and cultural heritage, Makarska is also famous for its rich and praised gastronomic offer. The city is filled with numerous eating venues, ranging from fine dining restaurants and typical Dalmatian taverns to simple pizzerias, fast food venues and pastry shops. During your stay in Makarska you should definitely try some of the famous and tasty local specialties in one of the praised eating venues such as Don Antonio, Ankora or Ivo. With its diverse nightlife offer, Makarska won’t leave you bored even long after the sun sets. The central cultural event of the summer is Makarska Summer Festival with its numerous drama and concert performances, exhibitions, poetry evenings, fishermen nights and a summer carnival. And if you seek for a more dynamic and modern ways of entertainment, head towards one of the numerous beach bars and discotheques and greet the morning with song and dance. The most popular local dance clubs are Petar Pan, Escape, West and Deep. Find information about selected Hotels, apartments and rooms in Makarska to choose the perfect place for your accommodation.